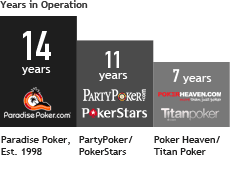 How big is Paradise Poker? 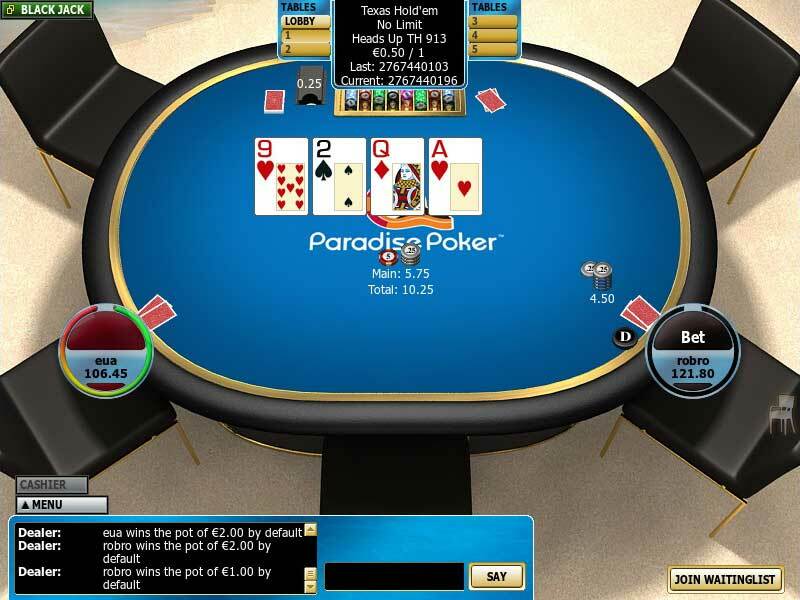 Founded in 1998, Paradise Poker is one of the industry's oldest sites and has amassed a database of over 2 million players. Additionally, the site is active in over 30 countries which means there are plenty of games available in whichever time zone you choose to play. Thanks to a universal rakeback offer of 30%, big players and new players will earn the maximum value back. 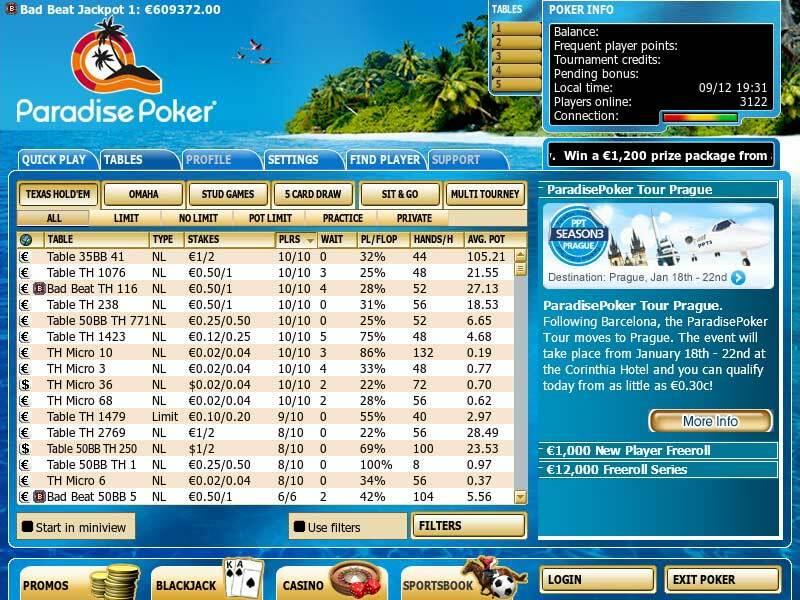 Paradise Poker is part of the International Poker Network (IPN). Player traffic volume is in the middle segment of the industry. During peak hours over 4000 real money ring game and 13,000 tournament players can be located. The games are somewhat loose and juicy and besides the 30% rakeback offer Paradise has some nice promotions and guaranteed tournaments, including the opportunities to play poker satellites and qualify for worldwide live events such as the WSOP and WPT. Players at Paradise Poker receive 30% Paradise Poker rakeback. This means that for every €1 you pay to Paradise Poker in rake at a cash table or as a tournament fee, you can expect to receive €0.30 back. All players must rake a minimum of €100 in a month to receive their rakeback payment. For example, if you paid €80 in rake in one month, you will not receive a rakeback payment but CAN spend the FPPs you earned that month on a cash bonus or good in the Paradise Club Loyalty Store. If you paid €200 in rake, then you will simply receive €60 in rakeback. Paradise Poker rakeback is paid at the beginning of each month and pays players 30% of the rake they paid in the prior month. Payments are never made later than the 3rd day of the month, and are often earlier. 30% of the total amount you paid in rake is automatically credited directly to your Paradise Poker account; you don’t have to do anything but enjoy the savings. If you spend any of your FPPs, you will not receive rakeback on the portion of rake that you paid to acquire those FPPs. 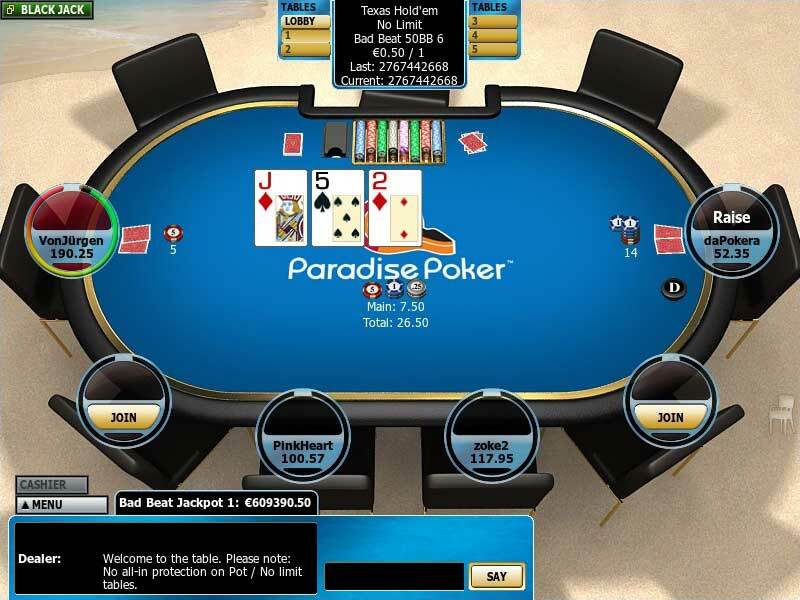 The software provided by Paradise Poker is developed by Boss Media and offers the standard functions and gadgets familiar to online poker players. 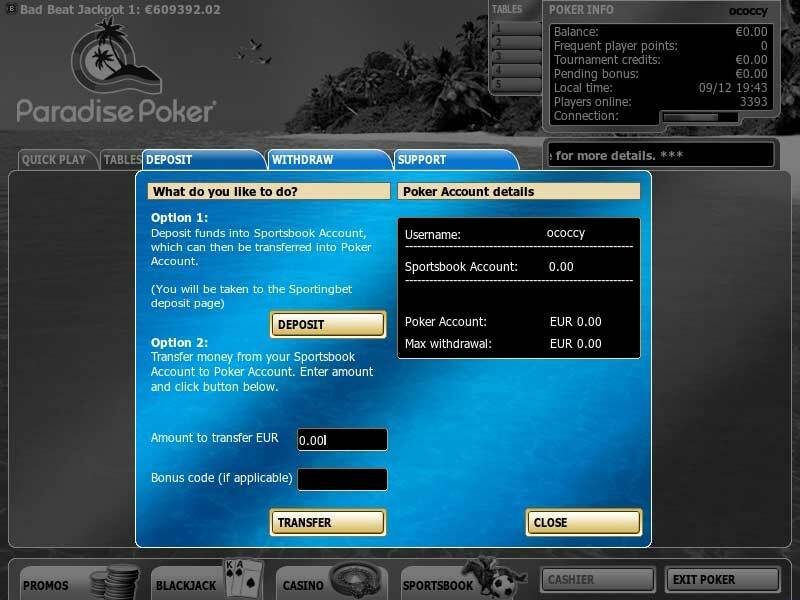 The functionality is good, with player notes, easy navigation, multi-currency play and deposit options. Paradise Poker is one of the first online poker rooms and it has been model for the industry. Many players feel ”at home” while playing on this friendly and soft-on-the-eyes interface. In order to guarantee rakeback and 200% match bonus on your new Paradise Poker account you must enter START1000 to the 'Bonus Code' box during the sign-up process.